Crash Landing At The Battle Of Okinawa. In April of 1945, the United States Navy began their attack on Okinawa but was met with fierce resistance from the Japanese Air Force. Explosions from anti-aircraft guns filled the skies as the U.S. Navy ships attempted to gun down kamikaze pilots hellbent on suicide bombing their fleet. One Japanese pilot makes a successful kamikaze strike on a U.S. vessel exploding into a tower of flames. The constant attacks begin taking a toll as two F6F planes are forced to return to a carrier and the other making an emergency landing in the ocean. 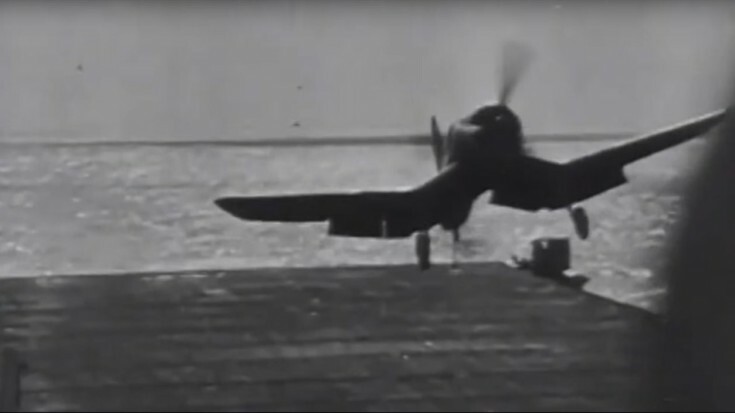 A battle-damaged F4U Corsair is not so lucky upon its return, missing the projected landing location and crashing into the carrier. The Corsair immediately bursts into flames as the crew rushes to save the pilot from his fiery tomb. The crew swiftly saves the pilot and puts out the scorching flames before they can cause any more damage to the aircraft carrier. The scene returns to the Battle of Okinawa to find planes crashing into the ocean causing huge waves one after the other in a torrent of destruction.